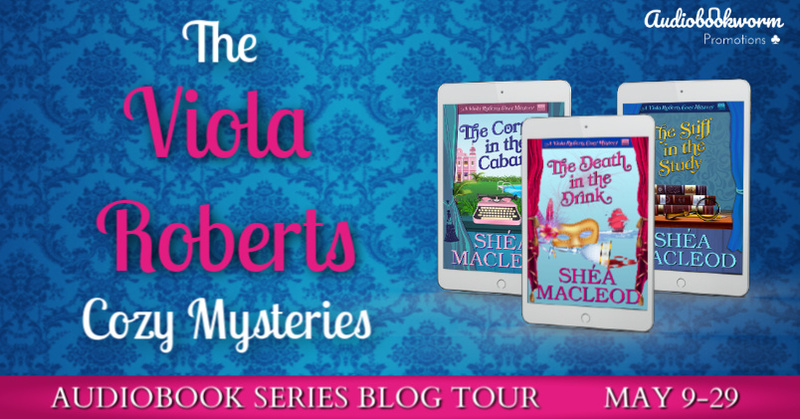 Audiobookworm Promotions is organizing an audiobook series blog tour for The Viola Roberts Cozy Mysteries, a Cozy Mystery series from Author Shéa MacLeod. The tour will run from May 9th to 29th and will have maximum of 7 review stops per book. Signups end on May 2nd. The Viola Roberts Cozy Mysteries are narrated by Yvette Keller. Reviewers will receive complementary digital copies of the audiobooks via Audible.com. Review copies will be distributed by April 13th. Reviews must be of at least 3.5 stars. Post options for this tour include: Reviews, Spotlights, Audio Excerpts, Author Interviews, Narrator Interviews, and Top 10 Lists. Remember to add jess@audiobookwormpromotions.com to your email contacts so tour emails don't go to the junk folder! CHOOSE A SEPARATE DATE FOR EACH BOOK (1 STOP PER WEEK).